We knew we had to eat Peruvian guinea pig before we left Cusco, Peru. In fact, we refused to leave the country without trying cuy at least once. Luckily, we found where to eat cuy in Cusco thanks to some great reviews we had read. Those reviews led us to KusiKuy, one of the best restaurants in Cusco. We had just gotten back from Machu Picchu and were pretty tired from the train ride from Aguas Calientes back to Cusco. It was around 9pm when we arrived at KusiKuy, still carrying our backpacks from the day’s adventures. Because we knew we were arriving late, we called ahead to place our order for cuy. We’d read in the reviews that it was a good idea to call ahead if you were ordering the roasted guinea pig since it takes about an hour to cook. The restaurant itself was beautiful and very nicely decorated. It’s been owned by the same family for years and they actually live upstairs above the restaurant. After we sat down, our waiter came by with menus and took our drink orders. He was very nice and had a great big smile. We went ahead and ordered an avocado salad as an appetizer since we were pretty hungry. It didn’t look like much, but it was really good. Then it was time for the main course. Our waiter brought out the whole cuy on a plate for all of us to take pictures with. 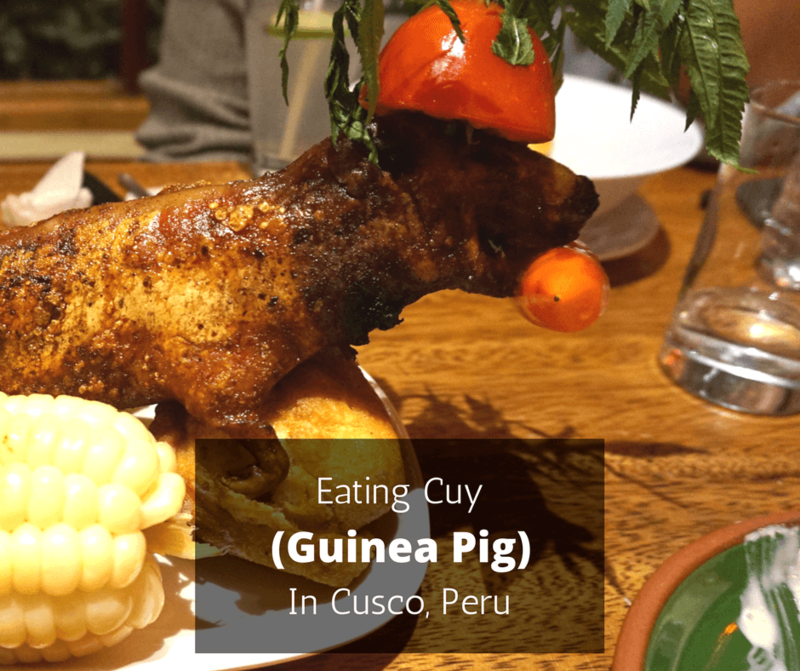 Although cuy is a staple in the Peruvian diet, they know that foreigners aren’t used to eating guinea pig and that we make a big deal out of eating these little animals that most have had as pets. While we waited for our plate, we saw other tables getting their whole cuys and each time it was a big and loud affair with everyone busting out their cameras. And we were no different. It was a little surprising to see the little guy completely whole; teeth, claws, and all! After the photo op, our waiter took back the cuy. He returned a few minutes later with the head off and cut into 4 pieces. Besides the cuy, the plate also came with a giant corn on the cob (also now cut in 4 pieces), small potatoes, and a meat stuffed pepper. The cuy itself was good. If you had just handed us a piece of its meat, we might have thought it was chicken although the taste was a bit gamier. The skin was a bit too thick and chewy for us though, maybe because it was roasted? The flavor was still good though. And that stuffed pepper was delicious! We really liked the dipping sauce too, even though we couldn’t tell you what was in it. We walked out of KusiKuy full and content. We could see why it had gotten so many good reviews online and why it is considered one of the best restaurants in Cusco. The service was exceptional, the food was great, and the prices were about average. You do have to walk a couple of blocks from the Plaza de Armas which is in the center of town, but that’s a good thing if you want to get away from the crowds. So if you’re wondering where to eat cuy in Cusco, we definitely recommend KusiKuy. It’s perfect for anyone wanting to try Peruvian guinea pig for the first time or for anyone looking for a restaurant in Cusco with a great ambiance. We know most have a problem with eating guinea pig… but that’s what traveling is about right? Getting out of your comfort zone and trying something new. I just tried cuy for the first time in Huaraz. It was a bit too chewy for me as well but it’s always fun tried something new. Also it was fun seeing the face my vegetarian sister made when I told her. However, I won’t be telling the kids I nannied for a year as they had 2 beloved cuys as pets haha. Are you still in Peru? The restaurant looks very nice and Peru is a place I desperately want to visit. I agree that traveling is about getting out of your comfort zone, but…well…I’m going to play my vegetarian card here! I’d love to try some of the local veggies, though! Thanks for sharing your experience. Oh my gosh, it has a hat an everything! Hah. I had cuy for the first time in Cuzco a few years ago and it was similarly posed. It wasn’t bad, but not sure I’d order it again. It felt a little like eating a rat. Not an attractive thing on a plate. I’ve heard about this before and I must say I would be a little squeamish about eating a guinea pig, especially after seeing it whole! I’ll try anything once though! Looks like you had a great meal. I want to try cuy. I like how they bring it out and let you take photos before they carve it up. It looks amazing. We all have such different opinions about what “should” or is “normal” to eat! i felt off eating pigeon in China, but they told me it was a delicacy, and although there wasn’t much meat to it! it tasted great! its all about experiences right!! I admire your bravery with trying local cuisines on your adventures! I think I would try it, as long as I had someone else willing to try it with me. I never had a pet guinea pig, so no real guilt here. Lol! The restaurant looks nice and I’m glad you enjoyed that meal. Great post chica! Yeah that’s true. Seeing the head and face does throw you off a bit lol! Go you for being an adventurous eater! I have never been and always respect those that can try different cuisines when traveling.